While our Prime Minister Tony Abbott claims Australia's boat policy saves lives, in reality it just pushes suffering offshore. 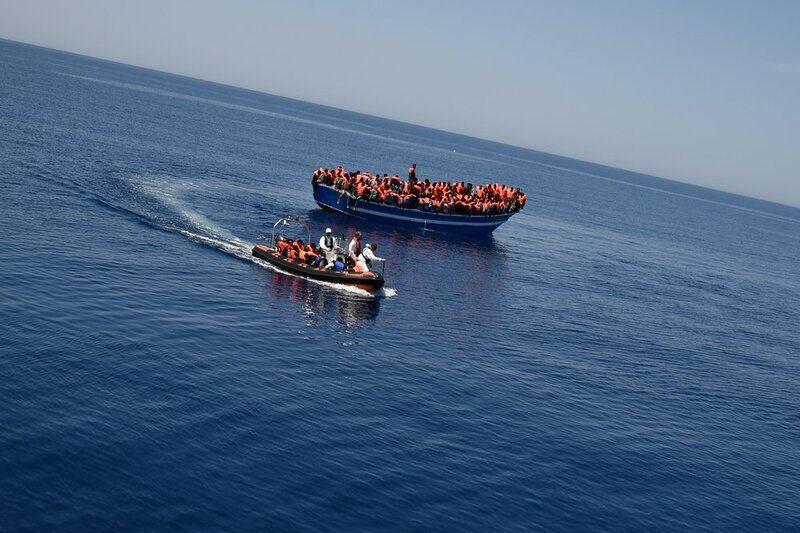 For Europe to follow Australia's boat return policy as a solution to the unprecedented human suffering and escalating death toll at sea in the Mediterranean would be both inhumane and misguided. Mr Abbott has referred to Australia's push back policy as "humanitarian". As an organisation founded on humanitarian action, we take offence. The humanitarian act is to save lives, alleviate suffering and restore some semblance of human dignity. It does not mean to build a fence between you and the population in need, so that the dying and suffering can take place elsewhere. There is nothing remotely humanitarian about that. At Medecins Sans Frontieres we respond directly to the consequences of war and violence primarily on women and children. Every day we see people in our hospitals and clinics having fled violence, hunger and disease, and in desperate need of emergency medical care. Yet Australia and Europe continue to focus the debate on people smugglers, prioritising border controls over the plight of people seeking our protection. This does nothing to solve the problems that cause people to flee in the first place. We need to dig a lot deeper to understand what is really going on. Right now the world is facing the greatest exodus of people on record since the Second World War, with 51 million people now on the move. With war raging across much of the Middle East and Africa, an estimated 5.5 million people were forced to flee their homes during the first six months of 2014 alone. Despite the active involvement of many countries (including Australia) in foreign wars, the human, economic and social cost of caring for refugees and the internally displaced is falling mostly on poor communities. I have seen this first hand. During my last visit to Jordan I saw communities struggling to house and feed Syrian families who had escaped the conflict. Yet they continue to do so, year after year. This is not sustainable, nor should it be – for those seeking protection or for those offering them refuge. Just four percent of the 3.8 million Syrian refugees have managed to be resettled in the EU. Ninety-five percent of Syria's refugees are registered in its neighbouring countries – in camps and urban centres in Jordan, Turkey, Lebanon and Iraq – stretching local resources and international assistance to the limit. By comparison, last year Australia took in just 6000 refugees from across the world. The discourse in Australia would have you believe that this migration of human misery is not our problem. Yet why should countries like Jordan be left to shoulder the burden alone? Australia must stop promoting a policy that simply pushes suffering offshore. Declaring war on people smugglers does nothing to end the wars that fuel their trade. It does not stop people in need of protection from fleeing. Instead, Australia needs to be part of the solution. This includes increasing, instead of drastically reducing, humanitarian aid to help address the factors that cause people to flee their home countries in the first place. Last year more than 3500 people drowned trying to reach European shores, many of them from Syria, Eritrea or sub-Saharan Africa. Thousands more have already died this year attempting this crossing. For Medecins Sans Frontieres saving lives is our core business, whether it is on land or sea. Today, we are launching our first boat in the Mediterranean as part of a joint search and rescue operation with the Migrant Offshore Aid Station. Our medical team are equipped to provide life saving care. Additional boats are soon to follow. These emergency operations will run alongside our shore-based programs in Italy, and Greece, and our many emergency projects in countries torn apart by the violence from which people flee: Syria, South Sudan, Iraq and Yemen. I believe Australia and Australians must take action too. As long as Australia and the international community continues to fail to find political solutions to existing conflicts and to prevent new ones starting, we will continue to have to deal with the dramatic humanitarian consequences. The tragic impact on human lives cannot simply be fenced off. Whenever there is desperation, people will take unimaginable risks in search of safe haven.